This post was co-authored by Vybava Ramadoss, Senior Program Manager, Azure Marketplace. Azure Marketplace provides a rich catalog of thousands of products and solutions from independent software vendors (ISVs) that have been certified and optimized to run on Azure. While customers love the breadth of our offerings, which range from open source to enterprise applications, one piece of feedback we’ve heard consistently was that navigating through such a huge catalog is difficult. 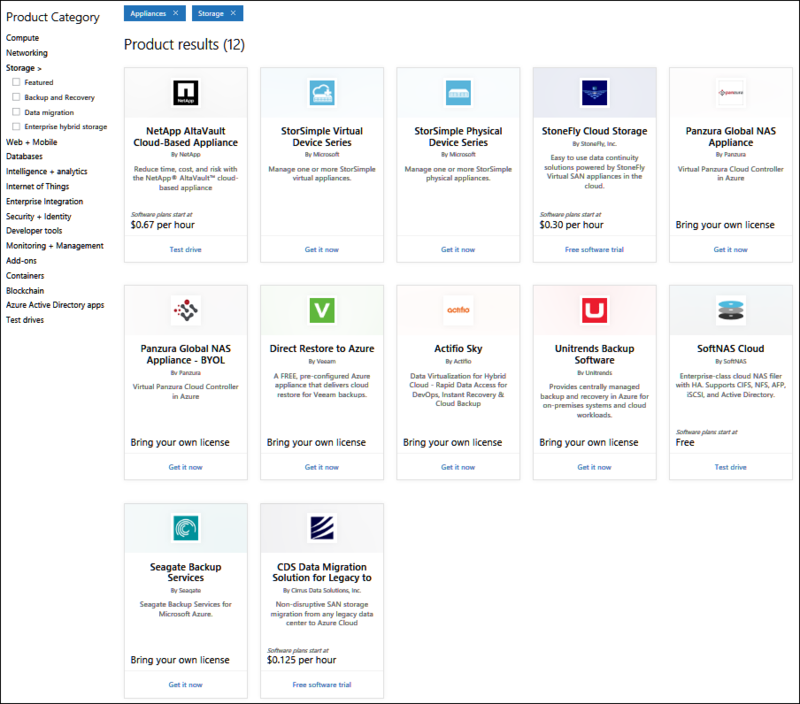 Today, we are excited to announce a new interactive experience for the Azure Marketplace that makes it easy to navigate the product catalog and find the right solution for your cloud application without having to login to the Azure portal. Launch the new Azure Marketplace. Let’s go over a couple of scenarios. Let’s say you are looking for a specific product. For example, you may be a blogger who wants a WordPress environment. You can start typing “WordPress” in the top search button and pick the WordPress option that best suits you from the list. 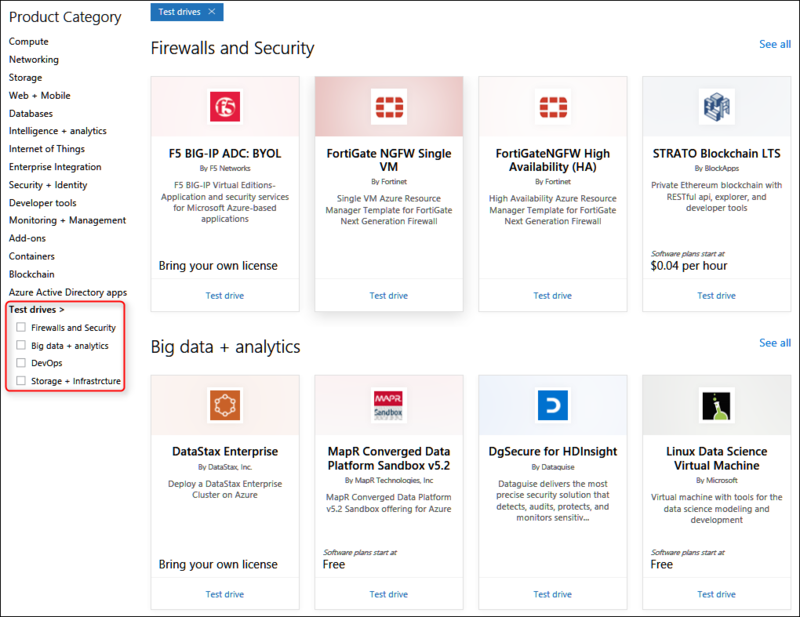 Click on “Get It Now” which will prompt you to login to the Azure portal. Follow the instructions, and you can have your WordPress environment up and running in a few minutes. Let’s say you are looking for a solution, but you aren’t sure which product best fits your needs. For example, you need a storage appliance for your cloud application, but you want to look at the available options and learn about the products before deciding. Discover new products - The categories in Azure Marketplace are a good place to start. 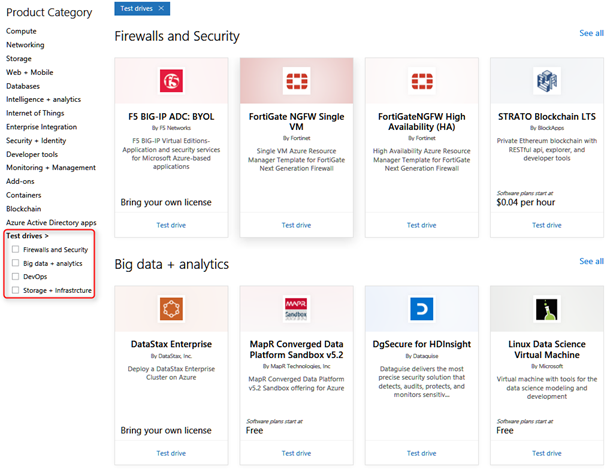 You can click on the Storage category (notice that categories are consistent with the Azure portal) to see the top recommended products or filter to a subcategory such as Backup and Recovery. But in this case, you are looking for appliances, and it isn’t a subcategory. Don’t worry; you can type Appliances in the search area to filter for appliances within the storage offerings. The search result shows you the brief description and the starting price for each available appliance. Deep dive to learn more – So, now you know the storage appliances available in Marketplace, but you need more information on the products to make your decision. 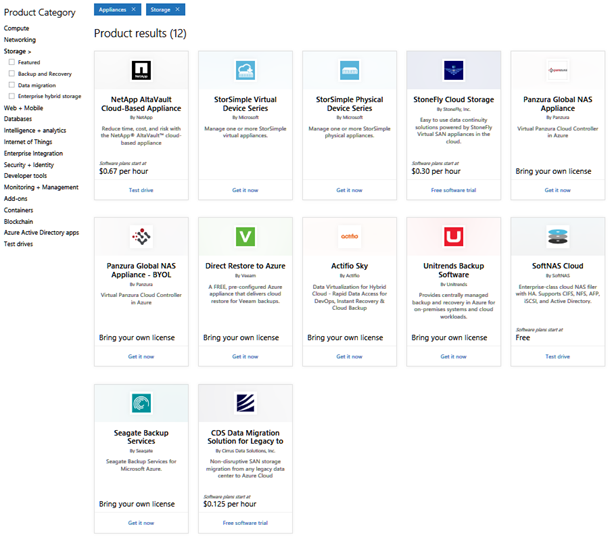 The new product pages make it easier and more convenient to deep dive into a product. 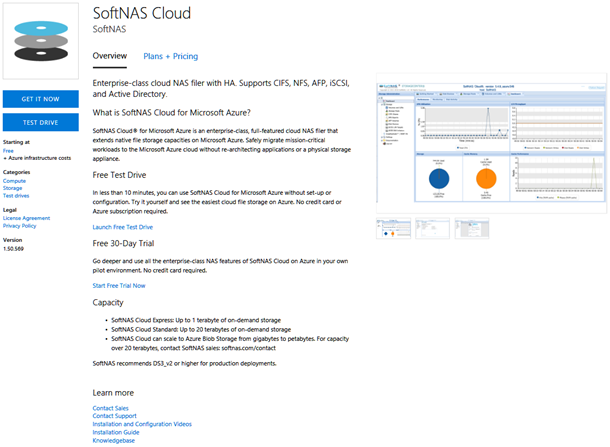 Let’s look at the NetApp and SoftNAS product pages. Click on the product tiles to open the product pages. You will see two sections. The Overview section contains the detailed technical documentation, product features, screenshots, etc. The Plans + Pricing contains the different SKU’s, pricing options, and publisher recommendations. Select a software plan -Shows the available pricing plans. Also, the Download table as CSV option enables you to export the pricing plan. Publisher recommendations – Tells you the recommended VM’s to use to deploy a product based on the region. Test drive the products - Now that you have gone through the potential candidates, wouldn’t it be great to try out some of these appliances before making your final decision? 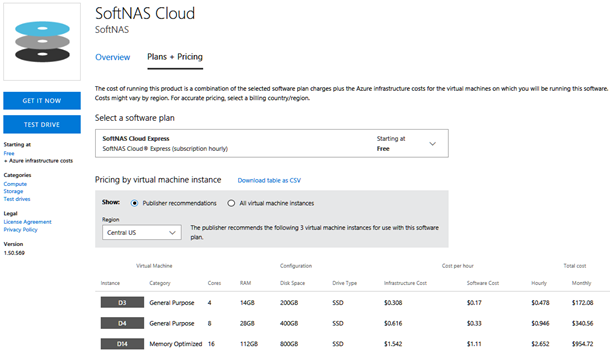 Azure Marketplace Test Drives let you do just that. Test Drives are ready to go environments that allow you to experience a product for free without even needing an Azure subscription. You can access a Test Drive from the product page itself or by clicking on Test Drives on the left navigation pane. 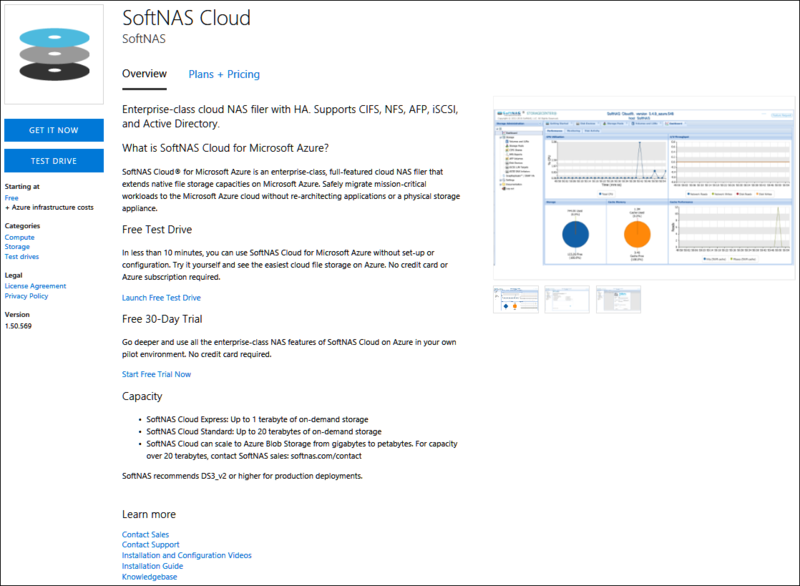 Both SoftNAS and NetApp products offer Test Drives – so go ahead test drive them to get a hands-on experience before deciding. The new marketplace experience makes it seamless to find and deploy your favorite product. We hope that the consistent and easy-to-use navigation structure along with the hands-on experience of Test Drives will make finding and learning about new products a fun experience. 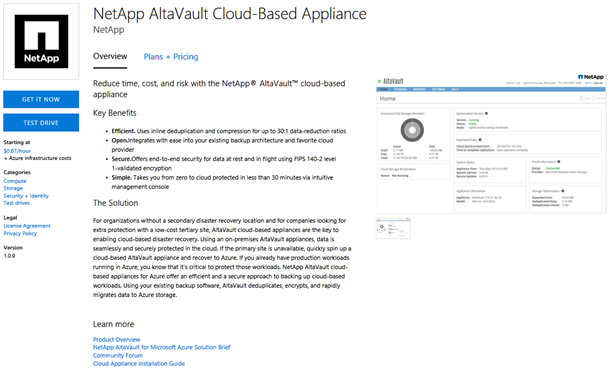 Try out the new Azure Marketplace and let us know your feedback. 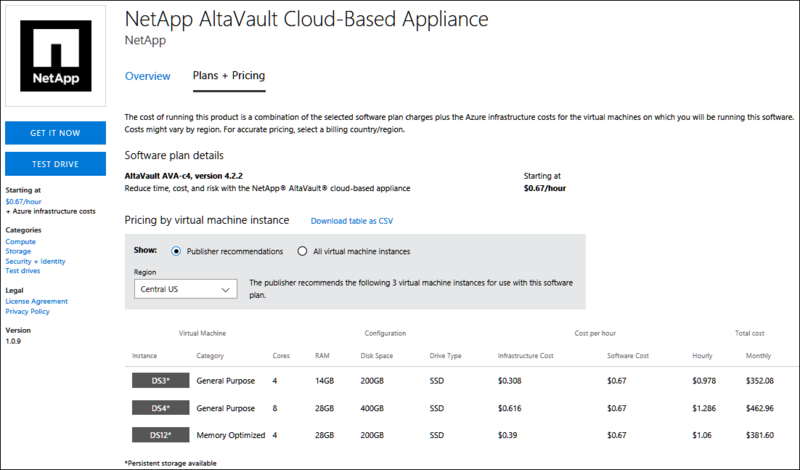 If you are a publisher interested in Azure Marketplace, visit the Sell on Azure Marketplace page and get started today.